Educational technology has a reputation -- deserved or not -- for being years behind the rest of consumer tech. There are a number of reasons why this might be: entrenched interests at both the school and corporate level, for example, or fears on the part of many teachers and startups to challenge some of these big players. But things are changing, and we're seeing innovation in a number of areas, including a new company to add to the list of Davids versus Goliath: Desmos. The Goliath in this case would be the Graphing Calculator, a piece of hardware that, for the last 20 years, has been synonymous with one company: Texas Instruments. A required purchase for many high school students, a graphing calculator will set you back around $100, depending on the models and the features. A product that could free students and teachers from a specific piece of hardware. 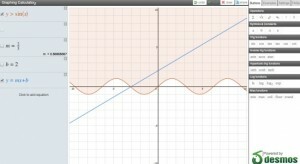 Enter Desmos, a startup out of Connecticut, that has built a graphing calculator alternative that may shake up the industry on two key fronts: it's Web-based, and it's free. The tool lets you plot and trace equations, and you can display multiple equations on the same graph. A menu on the sidebar makes it easy to add mathematical expressions and symbols quickly. The calculator supports the following functions: log, log2, ln, exp, sin, cos, tan, sec, csc, cot, acos, asin, atan, sinh, cosh, tanh, min, max, ceiling, and floor. There's a zoom feature, as well as the ability to share a link to your graph. The one drawback to Desmos's app is that it uses Flash, which means it doesn't work on the iPad or iPhone. The company says it's working on an alternative (and suggests that, in the mean time, you let Steve Jobs know how you feel about the lack of support for Flash on iOS). As amazing a potential that lies in this free, Web-based graphing calculator, it isn't actually the main product that Desmos is building -- although it's one that fits right in with the start-up's mission: build software that make hardware lock-on obsolete in education. The company's core product is actually a virtual whiteboard which will allow anyone to build browser-based content that will work on a multitude of interactive whiteboards, laptops, and tablets. As with the free graphing calculator, this product could mean that students and teachers aren't stuck with content attached to one specific piece of hardware. The team had initially built a number of math tools in order to help make these interactive whiteboard lessons "work" -- particularly for math and science, and one of the results is the Web-based calculator. Give it a whirl, and be sure to send the startup feedback.